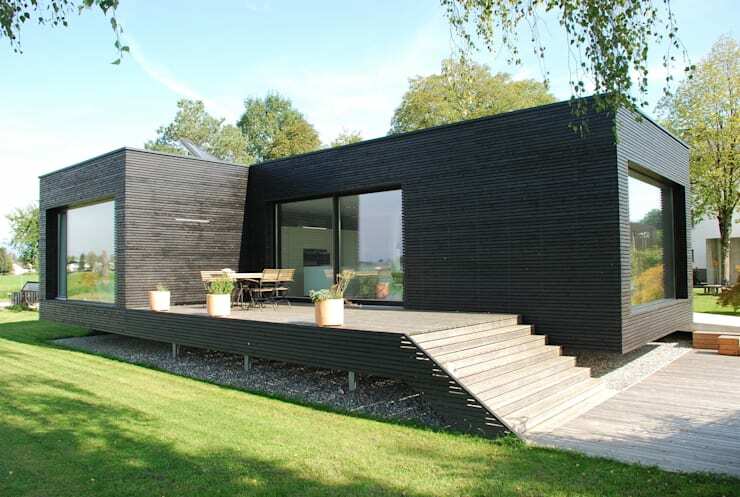 Homes and their designs have been evolving since time immemorial. If we look back, we can find many examples of how far we've come from primitive shelters to pyramids, castles and modern, gleaming skyscrapers. Yet, with each evolution in design and functionality, we've also left behind a deep carbon footprint that can only be undone if we look at more economical and eco-friendly options when it comes to our homes. 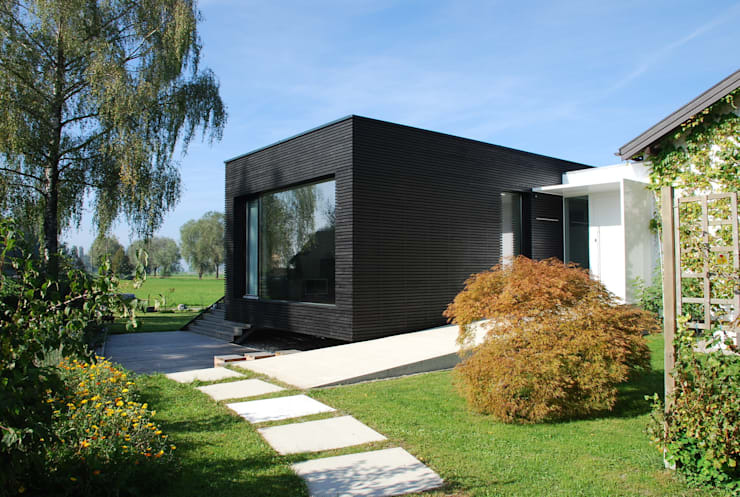 Here is a modern pre-fab home that is as environment-friendly as it is pretty. See why it has literally put a spring in our step! This home is set in a grassy meadow with a well-manicured lawn, which makes it look all the more appealing. The facade has a charming wide step incline, which leads you up to the deck before ushering you in. 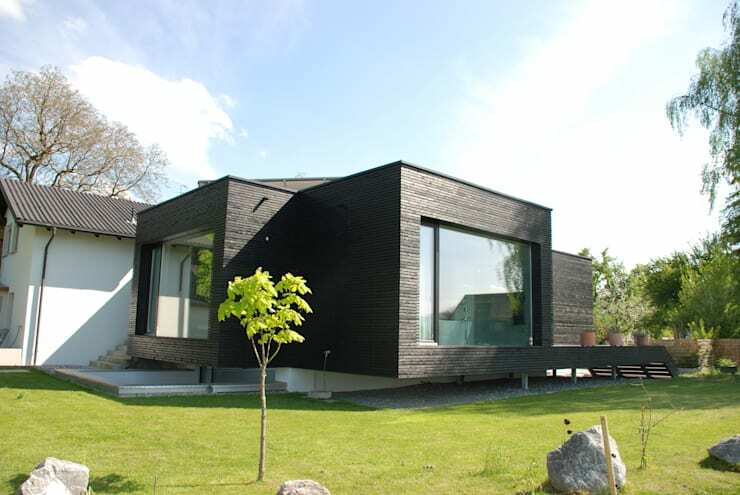 Mahogany wood has been used along with glass and some concrete in order to lay the home and create a stunning facade. The simple home is layered with greenery and vegetation, while a trellis-covered pergola stands on one side to give you some outdoor seating space. The interesting thing about this home is that the wide windows connect the outdoors and the indoors well by offering beautiful views. The stone-paved path adds a solid look and defines the garden in a stylish manner. The tiles and the wooden planks have a deep ingrained texture that makes it look like the pieces have been stacked one on top of the other. This gives the home a wonderfully natural and appealing vibe. The home’s symmetry is also visible from here with two wings receding behind the main room, jutting out into the back yard. Who says a modern home cannot borrow something from the past? This rustic chest under the television is a sincere departure from the tried and tested entertainment units that one finds in all homes today. 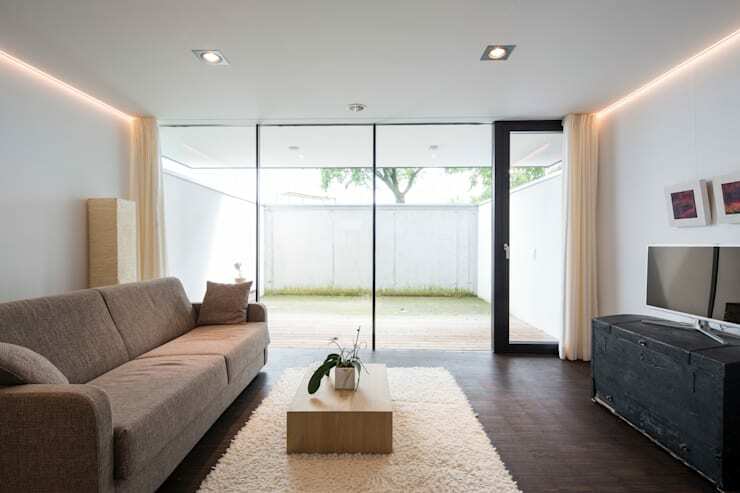 It literally lifts the style quotient of the beige couch and the miniature-style coffee table. With its molded chairs and the sleek industrial-style table, this kitchen looks like it has come straight from the future. 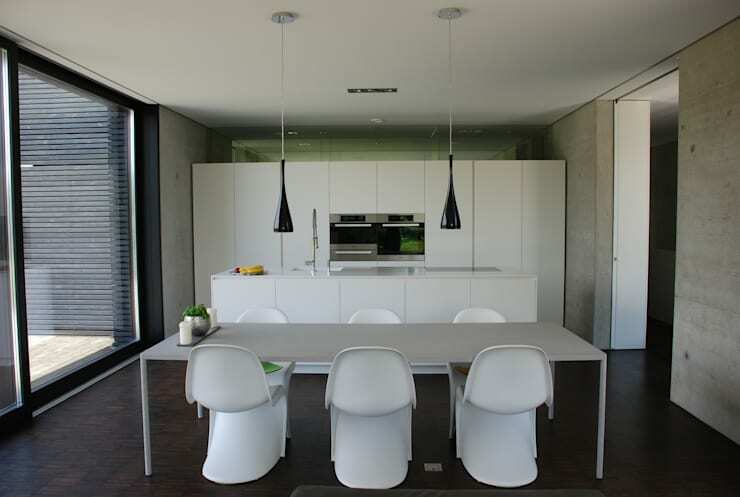 Slim black lamps contribute to a monochrome feel, while the storage has been pushed back to one wall of white. 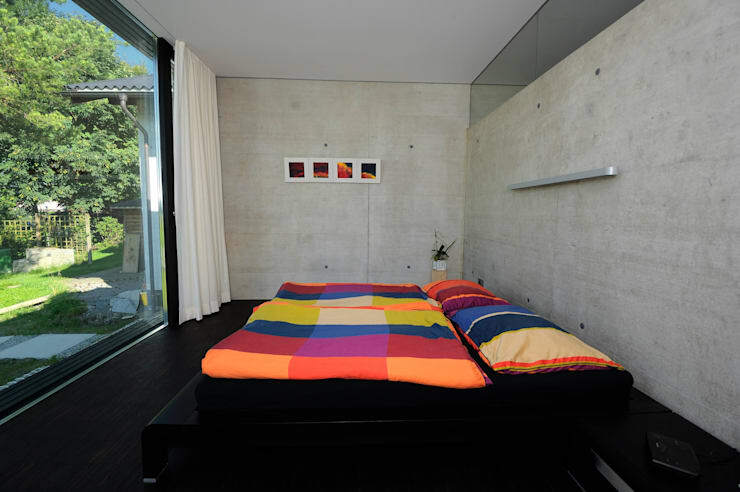 This stone-textured glass bedroom gets a visual story in the form of colour. The patchwork style bedding on the dark bed and floor ensure that your senses are riveted! The bathroom has an endless green view, thanks to the unhindered sheet of glass that forms one wall. The wooden floor and the cosy bathtub are a fitting contrast in the rest of the space. A stone wall, drapes and sleek white counters round up the rest of the look. Here is another story that might interest you: Between white and modern style: a fairytale apartment.